Davidâ€™s slide guitars have always been a big part of Pink Floydâ€™s sound. In the early days he followed the tradition of Syd, using different slide techniques to create effects and soundscapes. By the mid 70â€™s David mainly used lap steels and created some of his most memorable solos. During Pink Floyd’s US tour in October 1970, David bought a couple of second hand guitars at a pawn shop in Seattle. Among these were a Fender 1000 pedal steel. The guitar has two necks with 8 strings on each (David most likely used only 6 of them), Fender humbucker pickups, tone and volume knob and a neck selector switch as well as 10 pedals. However, David never used these and they were later taken off (as seen in the 2003 DSotM documentary). The 1000 was first used for the recording of One of These Days (Meddle 1971). However, David would perform the song on a Stratocaster with an open Em chord (E B E G B E) tuning between 1971 – 1973. - David pictured with the Fender 1000 (left) Paris, France June 1974 and (right) playing Breathe for the 2003 Dark Side of the Moon BBC documentary. The twin neck was again extensively used during the Dark Side of the Moon recording sessions (1972-â€™73) for Breathe and Great Gig in the Sky, with an open G chord tuning (D G D G B E). The guitar is first seen on stage in France, June 1974 (Great Gig in the Sky and Shine On You Crazy Diamond part 2). This was actually the first time David used slides live as he used the Strat on earlier performances (One of these Days, Atom Heart Mother and Echoes). The 1000 twin neck was last seen on the BBC Dark Side of the Moon documentary in 2003. “(â€¦) but one of the first jobs I had to do was to go out and buy two lap steel guitars for the different tunings needed on Great Gig in the Sky and One of These Days, which was an alternative encore but in the end they opted for Echoes. I went off to Sound City, which was the in place to go in the west of London, and they had two Jedsons, a blonde one and a red one. They were about 60 quid each.â€ â€“ Phil Taylor, Guitarist 1995. Little is known about Jedson but it seems that they were manufactured in Japan by several companies in the late 60s and early 70s under license from Dallas Arbiter. They mainly produced copies of Gibsons, Burns and Fender (acoustics, electrics and lap steels). The lap steels are straight clones of the Fender Deluxe table/lap steel with six strings, volume and tone knob and two custom single coil pickups. 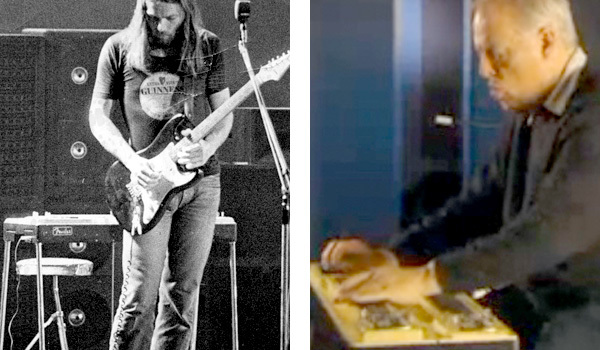 - (left) The original blonde Jedson lap steel used during the 1974-75 Dark Side of the Moon tour and (right) the new blonde Fender lap steel used during the 2006 On an Island tour. Gilmour used both Jedsons during the 1974-’75 tour. Both had an open G tuning, – the blonde standing behind Gilmour for Shine On You Crazy Diamond 6-9 and the red standing behind Rick’s rig for Great Gig so that Gilmour could play Hammond during the heavier parts of the song. The red Jedson was used on Shine On 6-9 during the Animals tour in 1977. Both the red and blonde was again used during the Momentary/Delicate tours in 1987-90, now custom fitted with white EMG H (humbucker) pickups – the blonde on Great Gig in the Sky and the red on One of These Days. The red Jedson was again used on One of These Days and also High Hopes on the 1994 Division Bell tour. The guitar was last used on High Hopes on the 2006 On an Island tour. 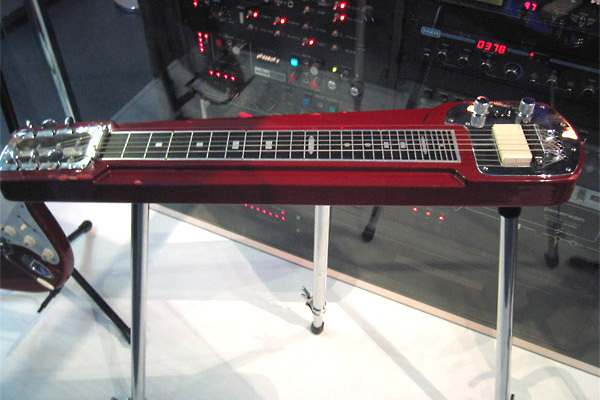 Just prior to the 1994 Division Bell tour the blonde Jedson was replaced by a similar Fender Deluxe 6 lap steel. This is a 60s model based on the Stringmaster – the Deluxe only featured one neck. The guitar feature 29 frets, two so called “wide-range high-fidelity” pickups, volume and tone controls and a pickup selector. David used the guitar on Great Gig in the Sky with an open G chord. The blonde Fender also used on Breathe at the Live 8 reunion performance in 2005. This was actually the first time David performed the slide solo live. David employed the Deluxe on the 2006 On an Island tour, while performing Breathe, Great Gig and Wotâ€™sâ€¦ Uh the Deal. The Deluxe is currently David’s main steel slide, being housed in his home recording studio Medina. The guitar was featured on the 2014 recording sessions for Pink Floyd’s Endless River album. 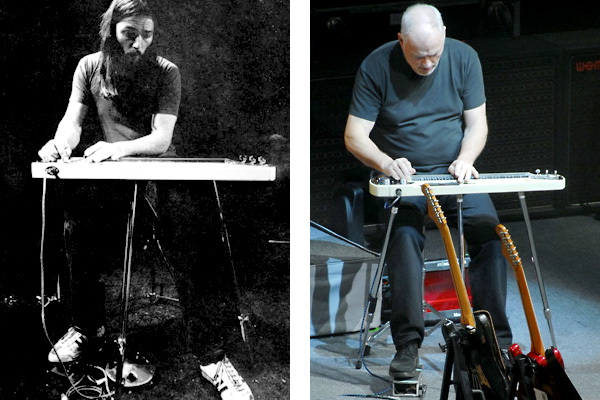 David used an early 1940’s Gibson EH-150 lap steel during his semi acoustic shows in 2001-02, – High Hopes and Shine on You Crazy Diamond 6-9. The Gibson was also used on a Paul McCartney charity show during the Run Devil Run period in 2000 and on the recording sessions of Take a Breath in 2005. 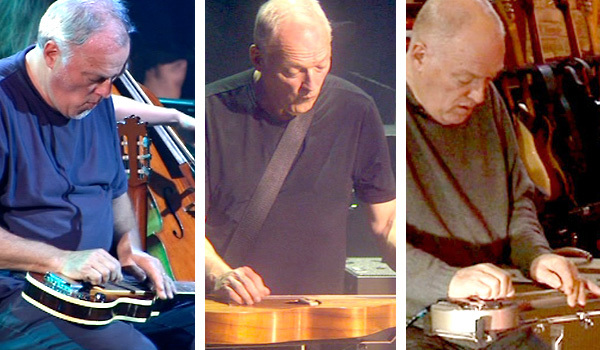 - (left) Gibson lap steel at the 2001/02 semi-acoustic shows, (middle) a Weissenborn acoustic steel used during the 2006 On an Island tour and (right) a Rickenbacker "frying pan" as seen on the 2007 "Barn Jam" sessions. On his latest solo album David also used a Hermann Weissenborn Hawaiian style acoustic lap steel for the song Smile. This is a very old guitar from Davidâ€™s collection, dating from the 1930â€™s. It was also used on live performances of Smile and Then I Close My Eyes. The guitar has an open Em tuning E B E G B E.
In January 2007 David, Guy Pratt, Richard Wright and Steve DiStanislao recorded a brief jam session at David’s farm in Sussex. On the piece Jam #166 featured on the Live in Gdansk DVD David is seen using a Rickenbacker A-22 “frying pan” lap steel. It’s also reported that David used a ZB pedal steel on the The Wall recording sessions. It’s not known which model or on which song(s) it was used.